Opening: Deerwomon introduces D’Coda and the topic. She reminds everyone that if they have any questions, they can always join in the Facebook group, Herbal Knowledge Keepers, and tune in to the conversations that are happening. 1:01 – D’Coda: We’re going to plunge in to the treatment of this, even though I’d like to go into more depth on the co-infections. But I decided that since there are a lot of viewers struggling with Lyme right now, to throw out a lifeline. So, we’re going to start with treatments and at some point, we’ll backtrack to go into the co-infections. And more about the elaborate testing and all that. When you go to the database and open it, this is always the opening screen. Using the search box I’ll look up Lyme Treatment Overview section. -	NOTE, screenshots are from Database version 1, there is now a version 2 which is very similar. Though the screenshots are of Database 1, for the transcript you’ll see shots from the more recent Database 2. When you open the info panel, we’re off to the races. Now, (in the info panel) there are a number of videos and websites that discuss treatment in general. We see that the CDC believes Lyme is a clinical diagnosis. A previous show covered what a clinical diagnosis is. They feel that the longest treatment necessary is 30 days of Doxycycline. The IDS, the Infectious Disease Society of America, has a similar viewpoint about it and they recommend a Lyme IFA screen and only a Western blot if the IFA is positive. In the testing area of the database you can find out what all of those terms mean. They also say that the maximum length of treatment is 30 days of Doxycycline. 4:04 So, when we hear comments like “antibiotics don’t work”, it generally reflects this approach. Using only Doxycycline for 30 days. After that 30 days is over, as far as they’re concerned, they have cured Lyme and any residual effects are treated with pain killers, maybe ADD medicine and psychological help, that sort of thing. So, they basically don’t believe there’s such a thing as chronic Lyme. 4:43 However, the Lyme specialists who, over the last 20-30 years have developed practices treating thousands and thousands of patients in league with research laboratories, who have a much more thorough understanding of this condition – they say there is chronic Lyme. And because the testing is inadequate, and because Lyme is the great imitator and can masquerade as ALS (that’s Lou Gehrig’s Disease), or multiple sclerosis, or 380 other diseases, that it’s important to keep treating Lyme. 5:32 There’s another organization called the International Lyme and Infectious Disease Society. Those are the guys that are, I would say, much more progressive and detailed in their understanding of Lyme. They’re the ones that provide a Lyme educational program for physicians that qualifies them as “Lyme Literate Doctors”. Those are the guys who are giving us the best physicians who are Lyme literate. 6:09 They have a completely different idea about what this disease is and different protocols that fall within it. A lot of them are using primarily antibiotics, and those treatments do work. But, its not 30 days of Doxycycline. They’re using protocols that cycle different types of antibiotics according to the different forms and growth cycle of Borrelia. They (patients) have days off, where there are no antibiotics and perhaps an antifungal is given. And they have an extensive support program revolving around lifestyle, diet, exercise, herbs, to make a more well-rounded approach. 7:06 In those programs we have, for example, Lyme specialists like Dr. Horowitz who was the vice-president of ILADS, and he’s been using everything he can get his hands on and has had 10,000 success stories. Although I will say, and I’ll get into this later when we get into the Cowden protocol, there was a time when he had 500 patients who were not receptive to anything he was doing. So, he called Dr. Cowden who uses an energetic herbal protocol for health, and brought in some of the recommendations from Cowden and those 500 people, most of them, recovered. 7:46 By the way, one of the big things Cowden recognized was that those patients were not drinking enough water. (Scrolling through the information on the open database Lyme Overview section) Here we give you more details to step you through a treatment overview, so you can understand why its so difficult to treat. What the immune effects are. I think I mentioned in a previous video that there are a number of doctors who don’t look at this so much as an infection, as dysregulation of the immune system. Because Borrelia, as a stealth organism, has all kinds of tricks up its sleeve to alter the immune system in such a way that it becomes invisible. And that alteration allows a lot of other bacteria, protozoa, viruses to come to life and take over the body. 8:46 Screenshot of Borrelia’s survival strategies followed by treatment duration. So, there’s a lot of information for you here on the opening screen on Lyme Treatment Overview. Burrascano is also one of the Lyme specialists, so is MacDonald. They have a lot to offer, they do use antibiotic therapy. 9:22 – I will say that I’m not a big fan of antibiotics, that’s heroic medicine and while it may resolve the Lyme symptoms, its not ever going to fully get rid of Lyme, the Borrelia, in fact, nothing seems to get rid of it entirely. We’ll get into that later. The main thing you want is a return to health. There may be some serious damage to the microbiome from these antibiotics (they do also use probiotics to mitigate that). 10:03 – (the Treatment Overview panel is closed) I want to go over some of your options. 10:08 – One of the big issues is brain fog. As you’ll recall, we talked previously about how Borrelia spirochetes head straight for the central nervous system. A lot of folks are dealing with brain fog. We see here there are two different kinds. The first is that feeling of fogginess in the head and the second is a problem with the actual function where there’s confusion, attention span isn’t so great, can’t find the right word. There’s a description here about what is behind this and some of the things you can do directly to help fix that side of it. But this is symptom treatment. What’s important to understand is that for a thorough recovery from Lyme or virtually any other infectious disease is we follow what’s called the Therapeutic Order. Think of it as a pyramid and at the base of the pyramid is where we use something called Restorative Method. We restore they body’s overall health. The metabolism, the body chemistry, the function of the organs with techniques like proper diet, exercise, sleep, etc. is required in order to actually recover. That’s the starting place for treating Lyme. Although when it’s acute you do have to go to the heroic medicines. 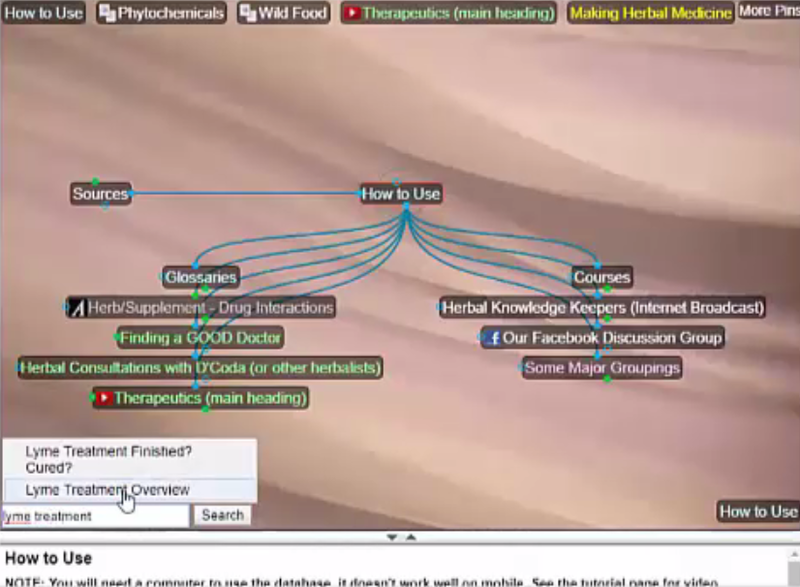 11:56 – D’Coda opens the section on herbs for treating Lyme. And if you look at this, its important to learn about these herbs and what they’re doing. They’re not all equal. They have different functions. 12:17 – A lot of folks have been excited about Stevia because of some news that came out that Stevia is more effective than antibiotics in killing Borrelia. What isn’t well understood about that is that those studies were done in vitro, in other words, outside of the body in a petri dish and there was direct contact between the Stevia and the Borrelia, and it killed it. That doesn’t mean its going to do the same thing in the body, mainly because Stevia is not systemic. Its not going to travel throughout the body and get into all the tissues and hiding places and kill Borrelia. Ordinarily I would have left it out because of that, however, I’ve noticed that Dr. Horowitz includes Stevia in his protocol. He has a deep understanding of all of the different kinds of research and for him to include it means he may know something about it that the rest of us don’t. So, I include it with the caveat that this is not the way to kill systemic Lyme. 13:30 – Deerwomon; So, D’Coda, can you speak to what each of these herbs address? D’Coda: I’ll do a few of them because I really want to move on to some other things, and we can come back to this. For example, Andrographis. In the Buhner protocol, which I’ll show you, he considers Andrographis to be the most important herb for treating Lyme. He’s saying, if you only have one, use Andrographis. (video shows screenshot of Andrographis info panel). 14:36; Here is a quote from his book and I’ll just read it. Because Andrographis has shown significant protective effects against inflammation-mediated neurodegeneration in the brain, it is essential to use in Lyme Disease. It easily crosses the blood brain barrier and accumulates in significant quantities in the central nervous system tissues – brain, spinal cord, and cerebral-spinal fluid. It can also be taken as a bitter 20 minutes before a meal.” It’s very bitter. The bitter principle can be used to improve digestion. So, improving our ability to take in nutrients is just another part of the puzzle. So that’s Andrographis. We have very powerful herbs that are being brought in to treatment by Lyme specialists who were previously just all about the antibiotics. 16:55 – What it does in terms of Lyme Disease, it doesn’t kill it outright by any means, but it helps to keep the actual spirochete in circulation as the spirochetal, or L-form, so that other antibiotic herbs or the immune system can find it and get rid of it. D’Coda; I think we covered this in a previous video, but Borellia has three different forms. It has the active form, which is the screw shaped, or spiral shaped living bacteria that looks like a spiral shaped worm that’s traveling around the body. Then it has an L-form that it takes when it’s getting ready to divide and possibly form the third form which are these cysts. So, one of its survival techniques is when the immune system has caught on to it and is killing it, or there are antibiotics (and this can be antibiotic drugs or herbs), when it knows those are around it turns into the cyst form and it loses the outer cell wall which is what the antibiotics and immune system uses as kind of like a homing device to find it and kill it. So now it’s become invisible to the body. Those cyst forms are dormant, they can be in virtually any part of the body. So, they’re just sitting around waiting for an opportunity to change back into the spirochete is what is generating a lot of the damage. 18:54 – Some of these herbs are adaptogens, so for example, the Ashwagandha, when we’re working at the foundational level, we want to have something that’s working as a broad-spectrum tonic that’s ideally bidirectional that’s giving active support to these tissues and organs that may be underperforming as a result of the disease. Tonic herbs are used for that purpose, this is just one of them. This one will be more effective for adrenal support. 19:45 – One of the important things about using these adaptogenic tonic herbs is, in view of the therapeutic order and the foundation that has to be laid, the Chinese were the real pro’s on proper use of tonic herbs and they admonished us not to use them unless we had the foundation well in order. People had a good diet, they were sleeping, they were exercising, they had the basics. If you don’t have the basics, if you’re on the standard American diet, and think you can take an adaptogen or tonic to fix everything, you’re actually at risk of having it backfire on you because it needs the proper nutrients that a good diet and proper breathing and the metabolism changes that occur during sleep in order to do their job. So, it’s not a replacement for lifestyle changes. 20:53 – Herxhiemer Reaction in Lyme – (screenshot of database) This is something that, if you are having a die off of any of these bacteria, for now we’re talking about Lyme, there are toxins that are spilling out of their little dead bodies that are causing a reaction in the body of severe symptoms. That’s called the Herxhiemer Reaction and until all that toxic waste material is cleaned out of the body, you’re going to feel sick. Some people don’t complete their Lyme protocol because the Herxhiemer is so awful. It can last for days and people just feel awful. One of the good things about it is that it’s a sign of a die off. You can do things about it and if you’re using your herbs in whatever protocol you’re on properly, they’re designed to minimize this Herxhiemer Reaction. If you don’t know what you’re doing, or your doctor doesn’t know, then you’re at risk of this increase of symptoms. 22:13 – One of the natural products, this herbal product Burbur, which is part of the Cowden protocol, reduces very quickly the Herxhiemer Reaction (screenshot of the information about Burbur is opened). You take this every 10 or 15 minutes, 8-10 drops in half a cup of water. When you have a Herxhiemer Reaction you know it, you feel significantly worse. This section is specifically about Lyme, there’s other information in the database about Herx. (D’Coda shows information in the database about what’s going on in a Lyme Herx Reaction) This shows when to expect stronger forms of Herx, this is in the chronic form of Lyme. How to manage it, there are different approaches. D’Coda: No, what you do for the Herx is more immediate, the parasite cleanse is a bit longer term. This is to quickly bring down the Herx itself. In some cases what the do is just say stop your treatment for a period of time. To let it subside. You may stop your treatment for a day or two and just do Burbur. D’Coda: It could be anything, an antibiotic herb. When we say antibiotic, let’s clarify, we have antibiotic herbs and antibiotic drugs and they both are aimed at killing the Borellia and both can (if they are actually killing it) result in Herx.